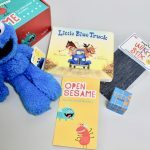 If you have been a reader for a while, then you know that I am a huge advocate of imaginative or open-ended play amongst toddlers & preschoolers. 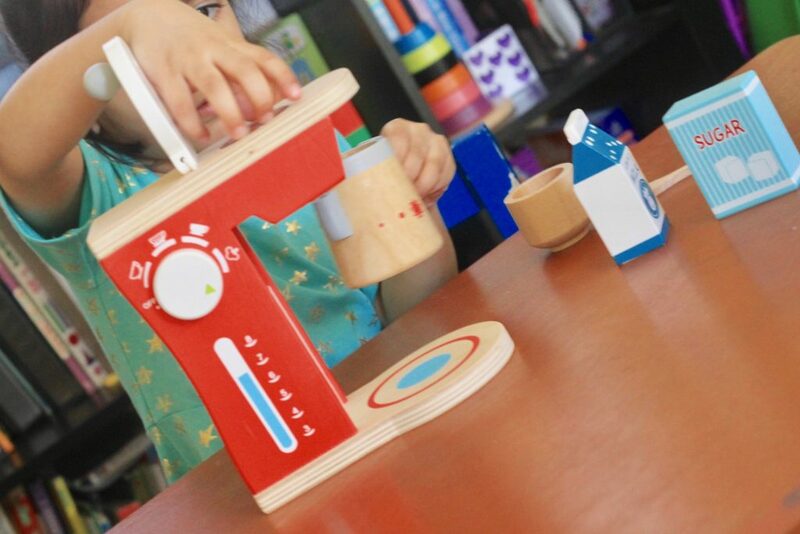 And while I do not mind toys that are flashy or have various sounds and noises, I truly believe that it is the wooden toys that genuinely facilitate open-ended play. 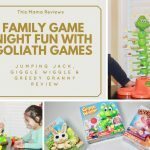 So when I came across Mommy’s Promise Toys – a company that specializes in bringing natural wooden & Montessori toys that are not only better for the environment but can be cherished by generations to come, I knew instantly this was something that will be immensely enjoyed by my kids. 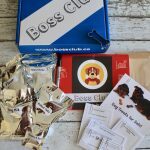 Disclosure: Mommy’s Promise kindly sent me these toys in exchange for an honest opinion. 2). 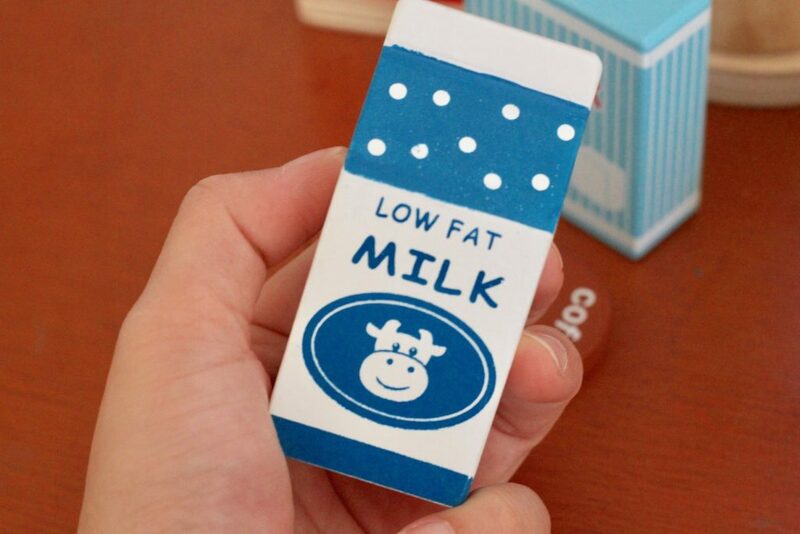 They encourage open-ended play and give children the ability to control and think outside the box. 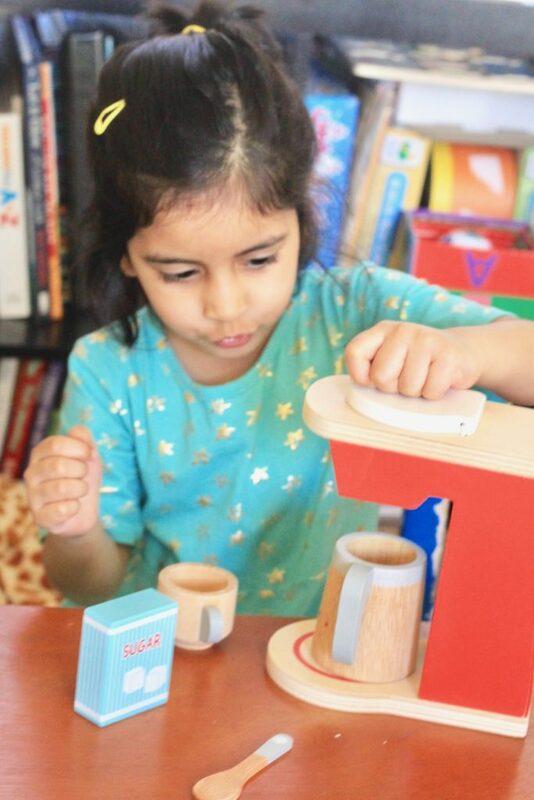 The wooden toys allow little ones to unleash their creativity while they imagine all sorts of scenarios in their pretend-play time. 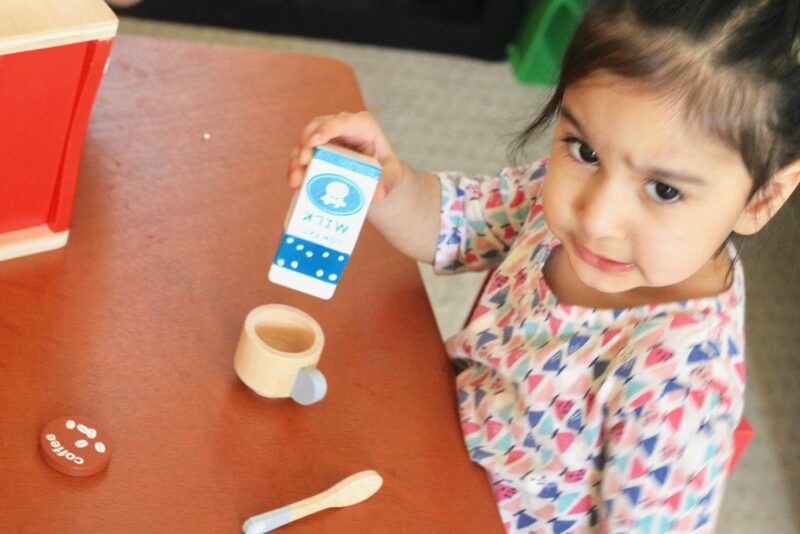 Furthermore, they help kids to navigate real-life situations. 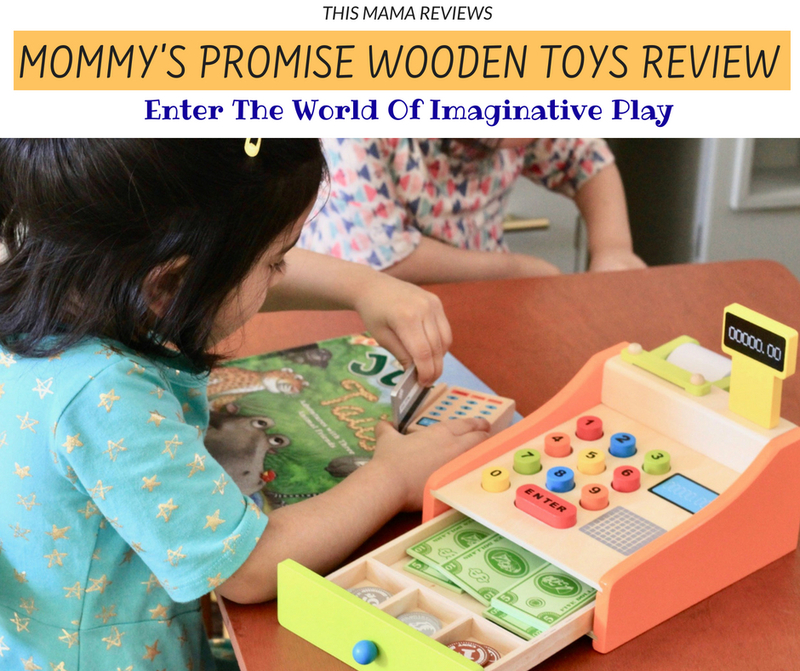 Scroll below to see how Mommy’s Promise Wooden Toys made the cut to be one of our favorites when it comes to rockin’ imaginative playtime! The coffee maker was very excitedly chosen by my 4-year-old who really is into open-ended play. Now I have to say that I absolutely loved the bright colors on these wooden toys – they are extremely inviting and just so nice to look at. My older one jumped right into brewing a cuppa coffee for mama. 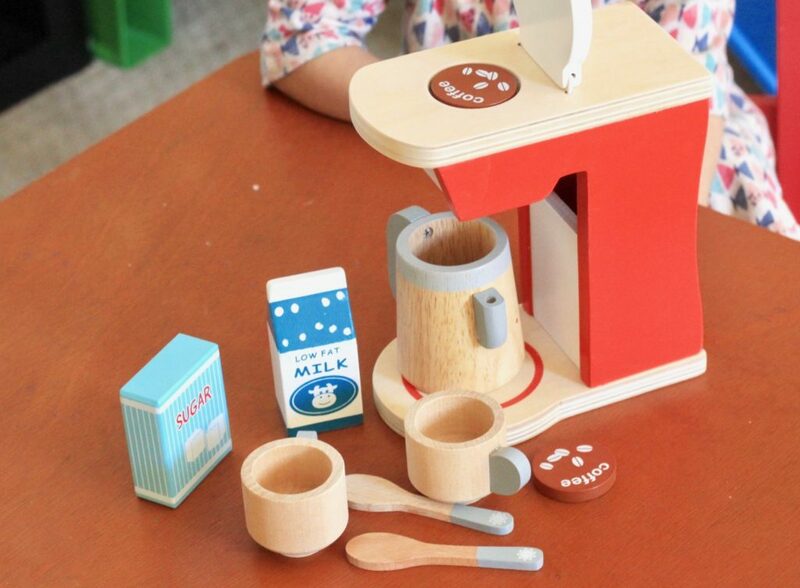 🙂 As you can see it comes with 2 spoons, 2 cups, 2 coffee pods, and the actual coffee-maker and the coffee mug. 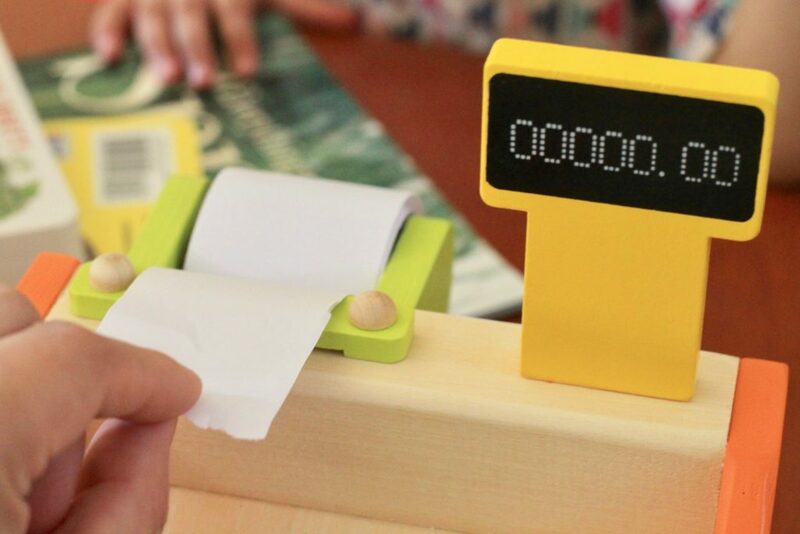 Time to check out and ring up each item with an adorably-realistic and colorful cash register! 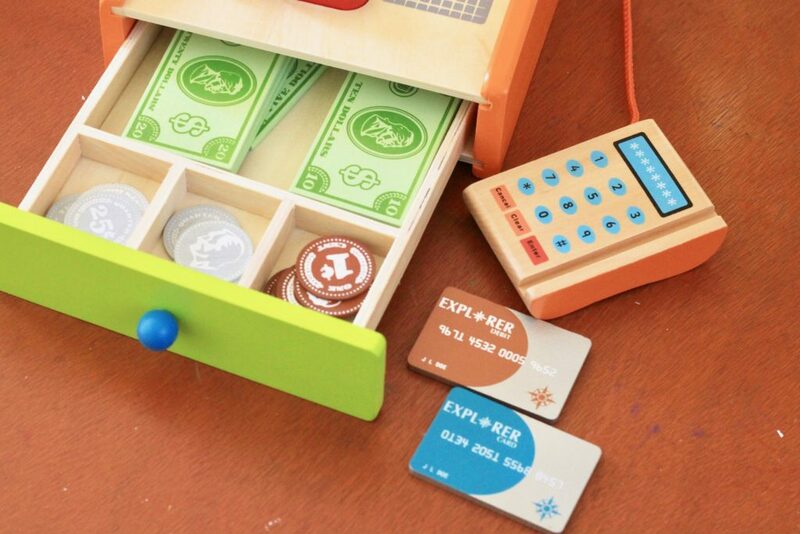 It comes with coins, credit cards, pretend cash – again all made of natural wood! I have seen cash registers that come with either paper money or plastic but I know for a fact that they would not last for more than a week. But these ones are solidly built and I can see my girls playing with it for years to come! Right off the bat, the little one started picking books from their pretend store to buy while the older one rang them up. 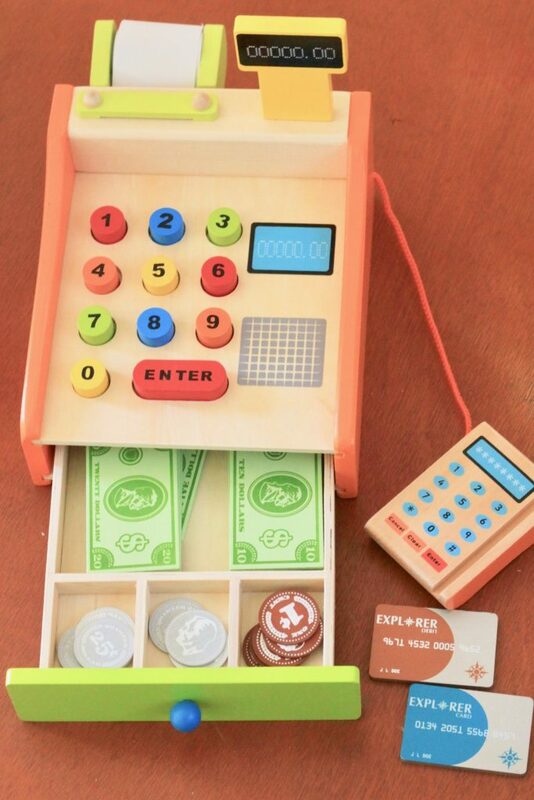 I love how they get to swipe their card in the credit card slot or they can choose to pay with cash! Love that both options were included. 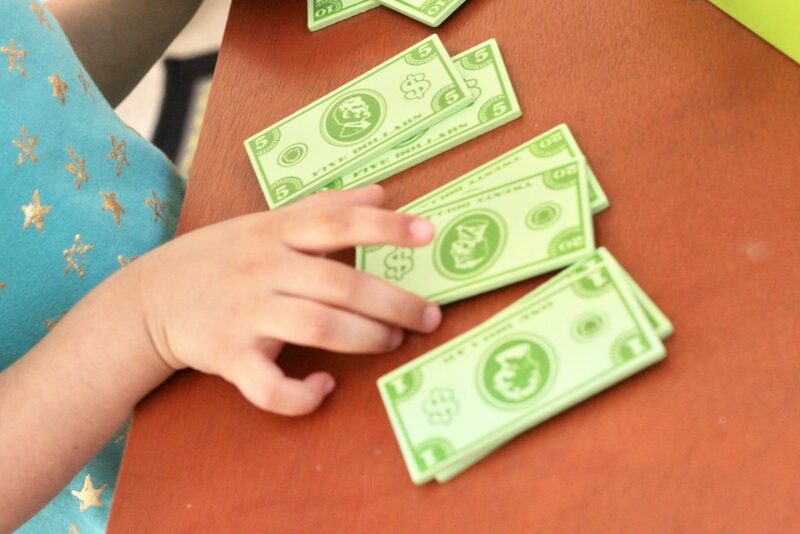 Overall, I couldn’t have been more pleased with the Mommy’s Promise Wooden toys. 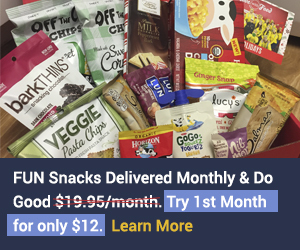 They far exceeded my expectations in terms of quality and value! 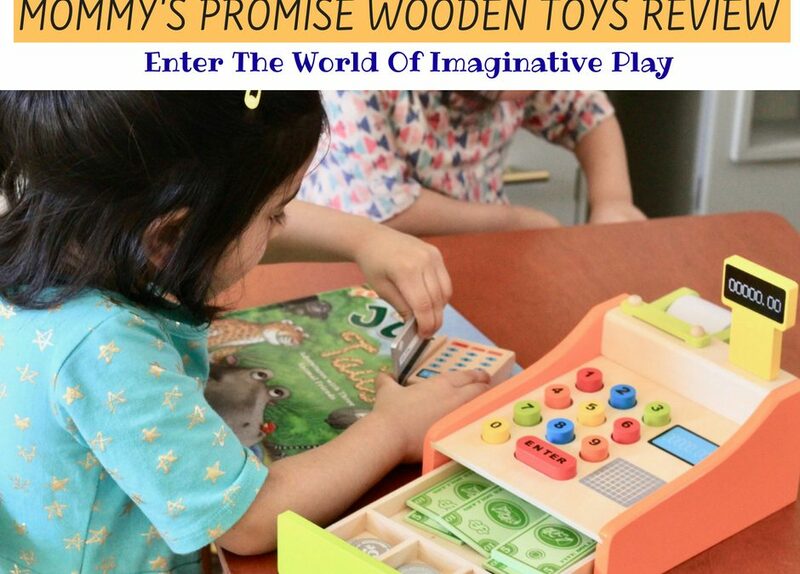 All Mommy’s Promise toys are manufactured with eco-friendly wood which is 100% safe and beneficial for kids’ senses and development. 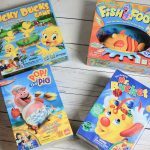 I also particularly loved the realistic yet colorful designs and the hours of learning & fun these toys have already offered! 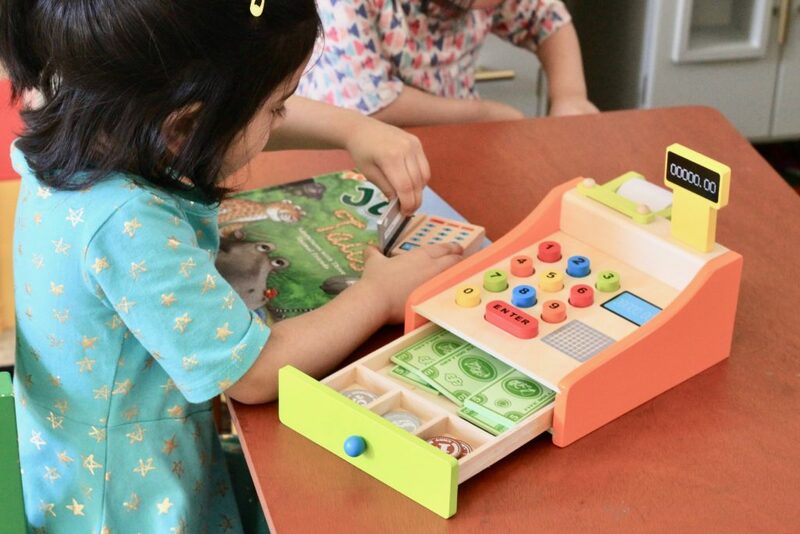 These toys are also very cost and budget-friendly as you do not have to pay an arm and a leg to be able to enjoy wooden toys that are made of high quality. 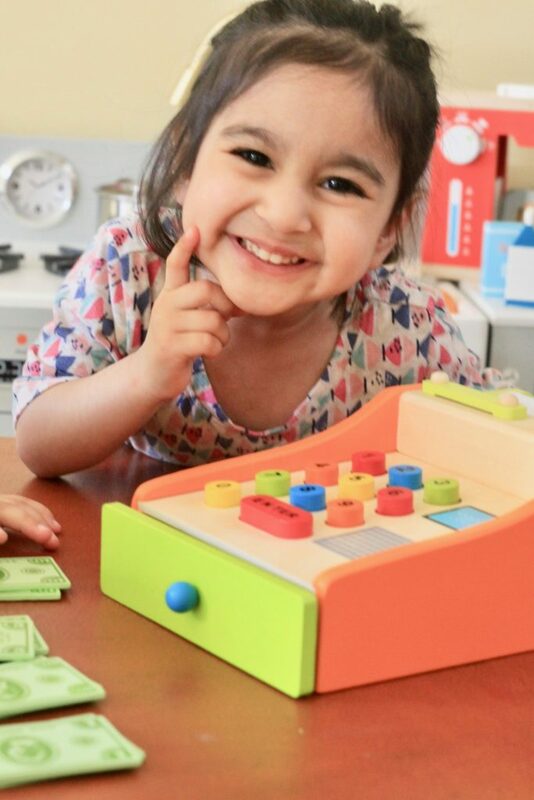 😉 If you haven’t yet, do yourself a favor and check out Mommy’s Promise Wooden & Montessori toys for your little ones and open up a world of beautiful imaginative play! 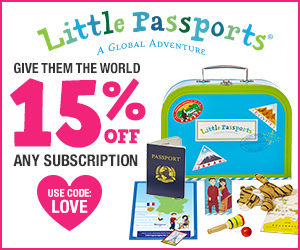 Mommy’s Promise was kind enough to offer my readers an exclusive discount – get 15% off your first purchase with the coupon code thismamareviews.